What comes to mind when you hear the word “contagious”? For most of us, it’s infectious agents, such as viruses and bacteria. However, recent evidence suggests that these agents may not be the only existing contagious elements in our world. 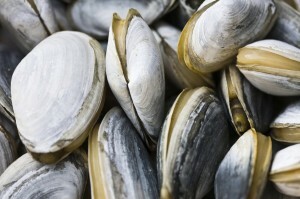 In a recent article published in Cell, researchers at Columbia University discussed an investigation of a potentially contagious cancer in clams. Though highly rare, this is not the first documented account of a contagious cancer; two other known examples include a facial cancer in Tasmanian devils and a venereal cancer in dogs. In this case, the researchers used a series of experiments revolving around DNA analysis to determine if the cancerous cells — diseased circulatory cells called hemocytes in clams — within diseased animals were clonal. The results were intriguing: The team identified a particular retrotransposon called Steamer whose copy number was significantly increased in diseased hemocytes compared to normal animals and normal tissues within diseased animals. With that, the scientists also identified several Steamer integration sites that were specifically present within cancerous DNA but not in normal DNA. Both of these taken together are highly suggestive of a clonal cancerous process as opposed to a stochastically arising cancer unique to each individual animal. The team further supported this hypothesis by analyzing microsatellite regions within both diseased and normal DNA. Strikingly, the cancerous genotypes again showed remarkable homogeneity, while the normal genotypes were mostly polymorphic. While this body of data is convincing, the question remains of what mechanisms allow these cells to be contagious. The authors posit several potential mechanisms for transmission. Though clams are sessile and therefore don’t come into physical contact with each other, they are filter feeders, and previous research has suggested the plausibility of affected hemocyte cells surviving in seawater long enough to be passed to another individual animal. It is also possible that human intervention has played a role in the dissemination of the cancerous cells due to recent seed stocking interventions along the coast. But even if we assume the cells can move between individuals, what mechanisms prevent them from being rejected in the new individual? Unlike the major histocompatibility complex system in mammals, mollusks lack a known process for rejecting nonself elements. It is possible that this lack of response could encourage this type of contagious cancer and perhaps is even a major reason why these types of recognition evolved in mammals. Though intriguing, these data are just the beginning of elucidating the pathways of contagious cancers. But an increasing body of evidence is accumulating to suggest these events are far more common than originally assumed.